EML-20A-20B-30A Data sheet. By Emission Labs. The first owner can register the tube at the Emission Labs website, to participate in the 5 years guarantee program. Using Directly Heated tubes in a separate pre amplifier is possible, but the design must be made with great care, and good understanding of signal to noise ratio (SNR). To keep SNR high, the volume control must always be at the output of the pre amplifier, and overall gain of the pre amp must be not higher as needed. For these tubes we use a very fine gold grid wire, with a gain of 21x for the 20A and 20B, and 32x for the 30B. It is recommended to use these tubes transformer or choke loaded. This is because you can use them at normal supply voltage then. Of course you can also use them resistor loaded, but then you need a supply voltage of 700V or more. 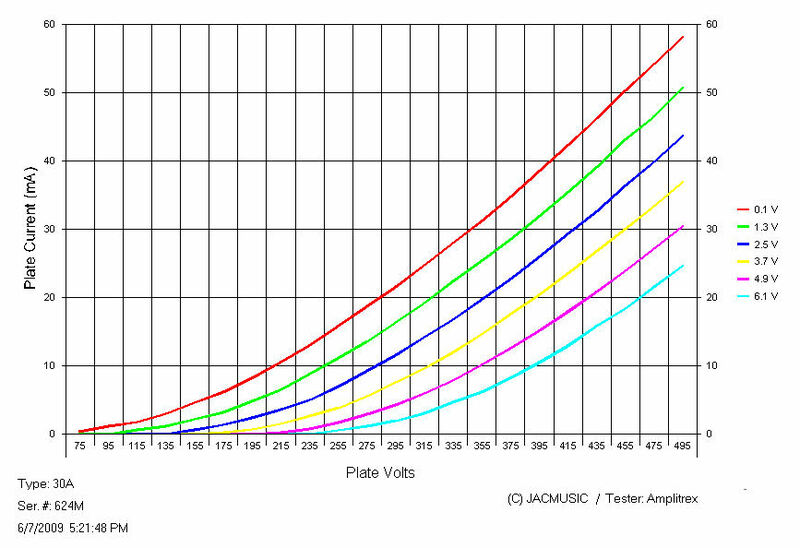 The 20A, 20B and 30A tubes are based on a very old principle, where high gain tubes have much wider plate distance. This is still the ultimate way to make a very linear DHT high gain tube. Miniaturization has always been the enemy of tube linearity, specially with DHT. The 20A/20B/30A will outdo any small size tube. We encourage you to check the tube curves of any miniature tube, like 6SN7, ECC88 or ECC82, and you will see this series presented here is much superior. However this results of larger dimension tubes is a higher working voltage. 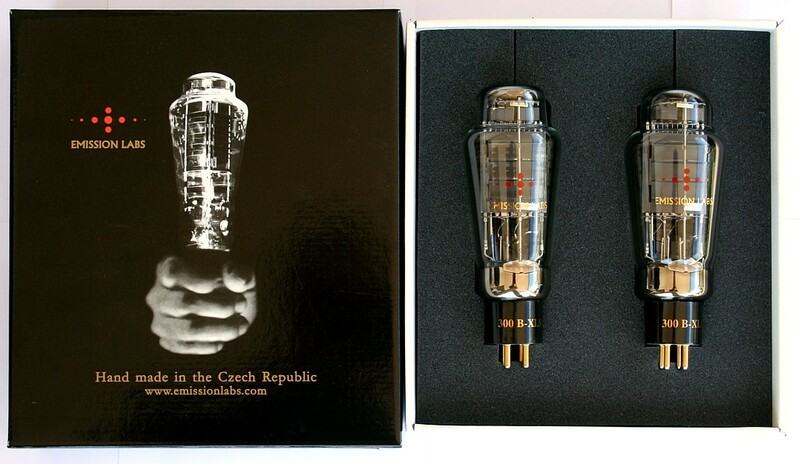 For this reason, tubes like this were not made any more after 1935, when miniaturization of tubes started to become more important. With the new production tubes we make today, miniaturization is no requirement. So for high gain tubes, we can now focus on lowest possible distortion. We build these tubes again the original way, with wide plates. Check plate picture here. For lowest possible mechanical noise with (any) high gain DHT pre-amp tube, use high quality tube sockets that do not pass the chassis vibrations to the tube. Chassis vibrations can come directly from the mains transformer, or by air from the loudspeaker. The best sockets for this are probably the Yamamoto Teflon, because Teflon is a flexible material. Use tight fitting Teflon tube dampers such as the Duende Criatura. They make the best damper for the EML tubes. They can be fit very nicely on the tube top, or one on the top and one on the bottom. We have two versions for the heater: Normal heater, or Balanced Heater. With the Balanced Heater, we enter an entirely new field of applications. This has not been done before with Audio tubes. When biasing a DHT tube there is no cathode to connect something to. The cathode must be artificially constructed, by a resistor network. Since many years, all EML tubes already feature a center tapped heater, which is a way to enforce better electrical field geometry. Only, this center tap has no electrical connection to the outside world. To the tube itself we had to make no changes, it is just we connect center tap to the socket, which becomes the third connection of the heater. Now the tube has five wire connections, and for this reason we can not use the 4 Pin UX4 base any more. We have chosen for the Octal base. 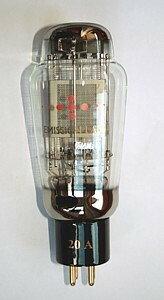 It must be said, the V4 is a very special tube, which fulfills the needs of Circuit Design purists the best possible way. Depending on how you do it, you can enter new design fields, or you may choose to connect the center tapped tubes just the classical way. Even so, for tube testing you can ignore the center tap, and just connect the tube the regular (four pole) way. In that case, the EML1605-V4 will behave like a standard four pole tube. In the case you own center tapped tubes, but you whish to connect them like a non-center tapped tube, this is possible too. In that case just do not connect the center tap. Specially designed by Lundhal for this EML tube ! When using an 1:4 input transformer like LL1922, you can even build a One-Tube-Amplifier (OTA). For EML20A-Mesh or 20B with interstage, use LL2746. It can be used 1:1 or 1:2. With 1:2 interstage, and an additional 1:2 INPUT transformer, such as LL1570-XL you can build a complete driver, for tubes like 300B, 45 or 2A3. Thus bringing down noise, hum, and distortion to an incredible low level as not possible otherwise. 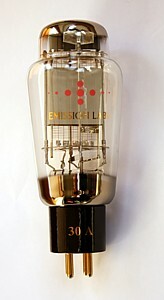 The EML 20A / 20B / 30A are universal and stabile tubes, combining high gain with low output impedance. The 20A-Mesh and 20B at a gain of 20, there is no comparable directly heated tube, that offers such a low plate impedance. This makes it possible to use the 20B as an output tube. 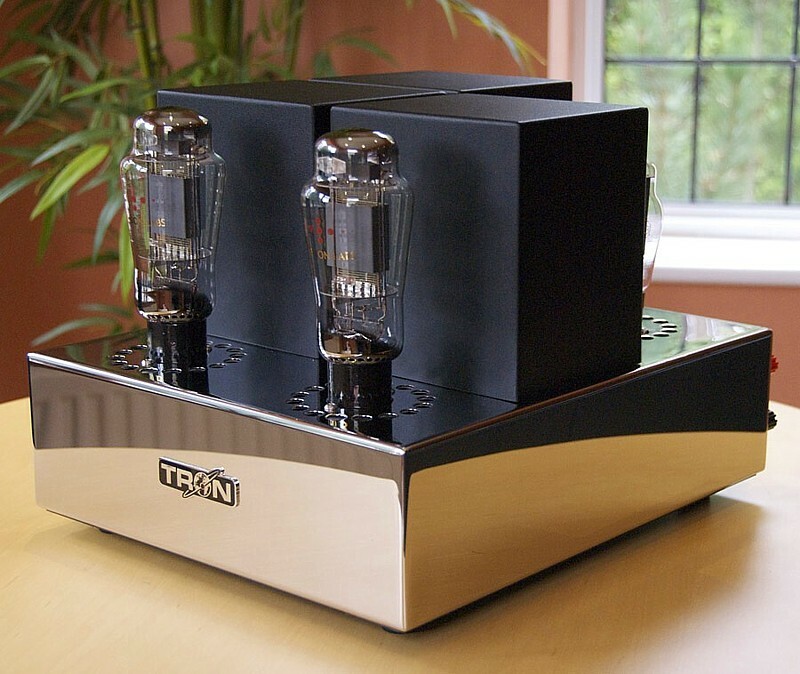 When using a step-up input transformer, no additional tubes are needed , so it is possible to construct a complete HiFi amplifier with just one 20B tube. As a driver tube, when using a plate resistor, 20A an 20B can work with high voltage circuits for an 845 using a high power supply voltage of around 800 Volt. For supply voltages around 400Volt the use of a plate choke is recommended to have sufficient plate voltage remaining over the tube. These tubes will often produce a blue glow on the glass. This is because of the wider plate distance, and some electrons escape after collision. The fluorescent light pattern changes with the voltage or with the signal. These light effects are normal for this type of tube. It must not be confused with gassy tubes, which produce a purple-blue cloud inside the plates. High resolution image here. Machined, solid tube base pins for highest contact precision. YAMAMOTO tube sockets highly recommended. Download EML30A curves as PTE file - What is that? These are extracted from the curves above. Note 3) The Sofia tube tester measures the grid voltage against ground, while the Filament is DC heated with one end against ground. This results in 2.5 Volt less grid voltage compared ti AC heating. For tubes with a gird voltage of 100 Volts, this disappears in the tolerance. However with such tubes as 30A which has only a few Volts, you should not be confused when you find your grid voltage not the same as tested by the factory. It is because of this reason. Note 4) Theoretically, distortion of two tube stages in series, are eliminated provided both tubes produce only even harmonics, and produce the same percentage of even harmonics for each frequency at each signal level. This can be demonstrated indeed with two triodes of the same type, and the same electrical circuit, and the first stage has adjustable bias. You will find one specific bias point where the second harmonic is cancelled out almost completely, at one specific signal level. Since the third harmonic is of very low content with DHT triodes, what is left is a very small fraction of 4th harmonics, even so cancelled very much. The result will be zero 2nd harmonics, the normal level of 3rd harmonics, though very low with triodes anyway, much reduced 4th harmonics, whereas 5th harmonics and higher are not present e any more. In a practical set up, you can use the 20A or 30A for this, and choose the bias point of this tube for best results with the end stage tube chosen. Ultimate results will be achieved with 20A driving the 20B as output tube. This needs no further pre amp tube, so two tubes make the complete amplifier. However also with 20A combines with 300B or similar will make a perfect combination since 20A curves are exceptionally linear, with resemblance to 300B tubes. This method of distortion elimination method has first been described by Ratheiser, in the four-books tube manual. This is a "standard about tubes and circuits theory, only available in German language. Also this method is described in the book "Verstaerker in Roehrentechnik" by Rainer zur Linde ISBN nr: 3-928051-02-4, also only available in German. The Japanese designer SAKUMA has published a great variety of circuits, based on this principle, even driving 211 tubes with another 211. Note5) Measured at 50Veff output signal: 0,11% and 0,07% distortion at 50Veff output signal. Operating point was 350V 25mA -7,5V. DN2540N CCS on anode. DC heated, and auto bias. Note6) Maximum conditions do not apply simultaniously. This is not a working point. © Emission Labs. All Rights Reserved.